Mathematics Education is part of the Division of Teacher Education in the College of Humanities and Social Sciences. 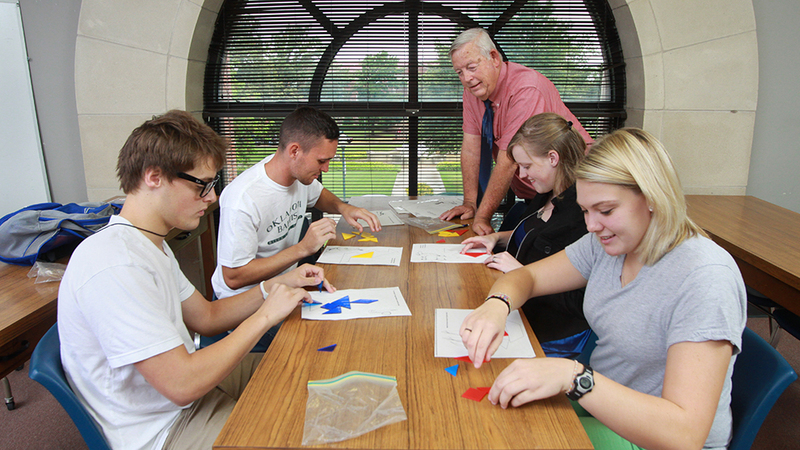 What makes an OBU Mathematics Education, Secondary degree special? The OBU Mathematics degree is special because students receive a quality education in one of the most powerful majors available, and they receive that education in small, personalized classes. Almost all of our junior and senior level classes have fewer than fifteen students in them. This allows for direct interaction with our energetic faculty. What are OBU grads doing with their Mathematics Education, Secondary degrees? Recent OBU Mathematics graduates are working in the aerospace industry, finance, and other fields; pursuing graduate degrees; and teaching in Oklahoma and many other states. Mathematics degrees begin with the calculus sequence. Majors also study differential equations, linear algebra, statistics, and the history of mathematics. Students also have the option to take courses in numerical analysis, real analysis, abstract algebra, geometry, and complex analysis. These courses are essential in mathematics, physics, engineering, and computer science. The Department of Mathematics has an active Mathematics Club and regularly sends students to regional mathematics conferences. Students work closely with our mathematics faculty to pursue their mathematical interests.